Chiplun, which literally translates into "The abode of Lord Parshuram", is situated in the in idyllic surroundings of the Konkan, the lush hinterland of Maharashtra. Surrounded by the hills of the Western Ghats on the banks of the Vashisti River, Chiplun has been an alluring destination for visitors from far and wide for its beautiful landscape, temples and commercial significance. 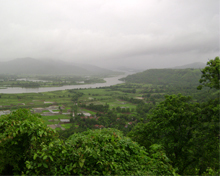 Visiting Chiplun during the monsoon season will be a feast for eyes. Known for its pharmaceutical and chemical industries. Chiplun is also noted for the Govalkot, on the top of which is a hotel. 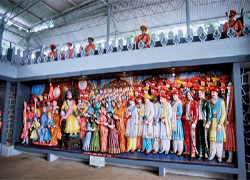 Visitors can explore places of importance in and around Chiplun. 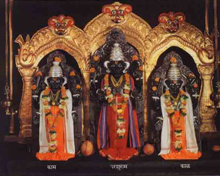 The ancient temple of Parshuram is one of them and is a sacred place for the devotees. Parshuram is one of the avataras (incarnations) of Lord Vishnu. Though he is frequently referred to in the sacred literature, there are very few temples dedicated to him. Perched on the top of a small hill, the Gowalkar fort offers the spectacular view of the surrounding valley and the Vashisthi River below. A trek to the fort usually takes 30 to 40 minutes. On the top of the fort is a hotel. 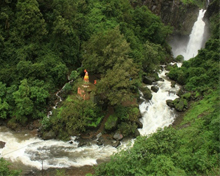 Sawatsada waterfall is another attraction in Chiplun. Vashishti river is known for boating and angling. In Chiplun there are good number of hotels which offer excellent accommodation opportunities. Quality Resort the Reiver View, Motel Vanashri and Swagat Lodge are some of the famous accommodation options for those visiting the town. A day in the scenic surroundings of Marleshwar in the Ratnagiri district will bring you peace of mind. Home to a Shiva shrine reached by passing through caves, Marleshwar is located 90 km from Chiplun. The presence of the Dhareshwar waterfall makes it an inviting spot a trip to which will be an unforgettable experience. 20 km from Chiplun is situated Walavalkar Trust Museum where one can have glimpse of the life of great Maratha ruler Chatrapati Shivaji Maharaj. Located 110 km from Chiplun, Raigad Fort ranks among Chhatrapati Shivaji’s formidable forts. The place also served as the capital of Shivaji from 1664 to 1680. 105 km from Chiplun. Mahabaleshwar is the highest hill station in Western India. Nestled in the hills of the Western Ghats, Mahabaleshwar offers a cool retreat from the sultry coastal Maharashtra. 45 Km. south of Chiplun, Guhagar is famous for its long stretch of silver sand beach. 18 km from Guhagar, Velneshwar is a small seaside place which is home to a Shiva shrine. 20 km from Guhagar Hedvi is visited by people for its beach and a shrine dedicated to Dasabhuj Lakshmi Ganesh. Kismat Residency, Hotel Prestige, Karmayoga, Kautilya, Musale Hotel, Sagar Lodge and Sri Pooja Lodge are some of the hotels in Guhagar. Located in the Ratnagiri district of Maharashtra, Chiplun is an important railhead on the Konkan Railway Line. Good motorable roads connect Chiplun with Mumbai, Pune, Ratnagiri, Udupi and all the major places in India. The nearest airport is in Mumbai which is 240 km from Chiplun.